I drove home for Christmas, through Alabama and a massive ice storm. The morning I left, maps showed that I'd be hitting ice all the way home. I said a prayer and went for it, disregarding the impending ice. I was never touched the whole way there. It was as if the storm circled around me but I was safe in the moving eye. It snowed the entire time I was in Indiana, and we all went stir crazy, but I had my laptop I'd borrowed from my unit for the academy, so I had outside communication. 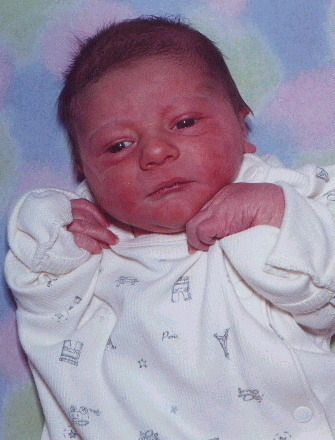 On December 29, 2000, my sister, Brenda, gave birth to her second child, Aaron Fischer. Now she had Cameron and Aaron, and that Keith guy she married in 1992. On January 2, I finally got the "post Daddy" family picture I'd tried to get in 1998. 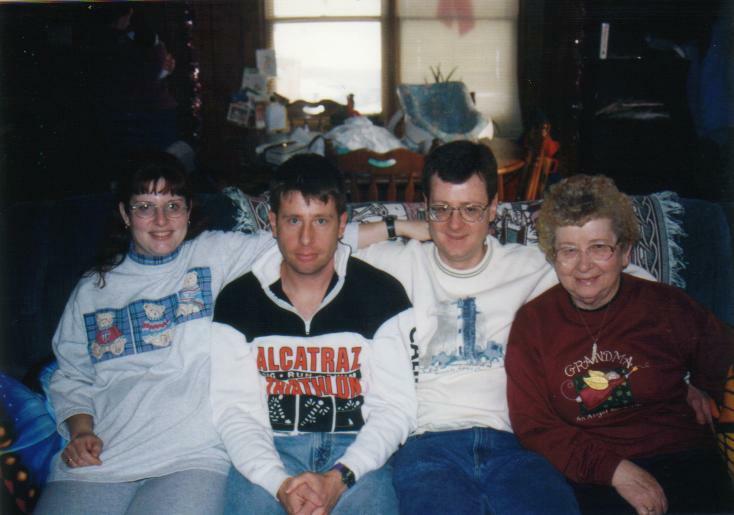 This was my family, with Mom wearing her 'Grandma' shirt just to be absolutely sure there is no confusion. The next day I set out for Virginia and to what was to be my year. I enjoyed working with Scott, and although he was serious about his work, we both had a sense of humor. One day he needed to babysit his children Taylor (6 years) and Joshua (1 year), and since they were very well behaved and it was only for a very short period of time, I told him he could keep them in the office with us while we worked. Scott gave a dry erase marker to Taylor and she drew this (bottom photo). On the right is Scott, his wife and two kids (and a third one? He only had two...). She drew me (Mr. Horsey), and at the time I was talking to Angie, so she drew her (the three dots). The depiction of Scott was spot-on. 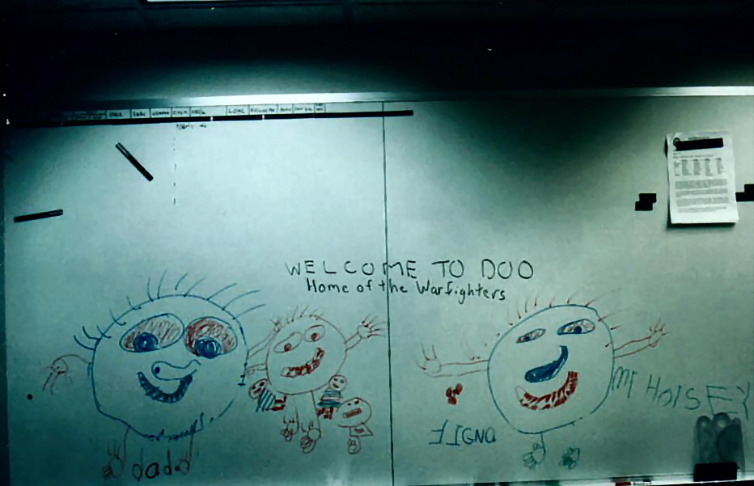 I loved it so much, I left it up and added,"Welcome to DOO, Home of the Warfighters" just so it would look official. Our office symbol was 36th Intelligence Squadron, DOO---for Director of Operations something something. I don't think we knew what it meant then! But who says the Air Force doesn't encourage personal expression?? ?